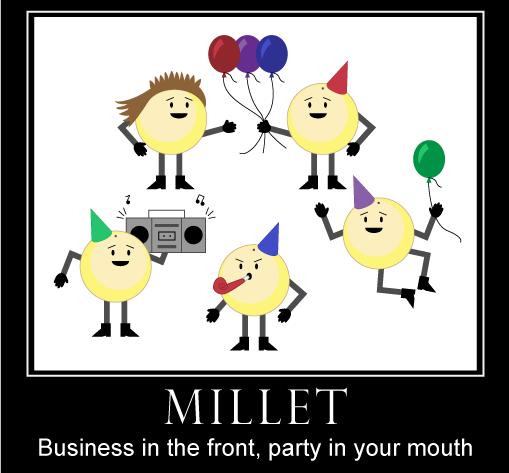 Millet hit rock-bottom when he had to share a grain of the month party with Teff. Luckily, Millet is a good sport. He knows when it's time to be the life of the party and when he's better off as the wallflower. Sadly, we can't speak for the dude with the mullet. Hat tip to @sirrice. Can I suggest a change.org petition in order to get millet his own month? Seriously, where's the justice? No justice, no peace. Also, those carrot cherry breakfast cookies look gooooooood. Amen. Be the change you want to see in this world, young Lindsey.